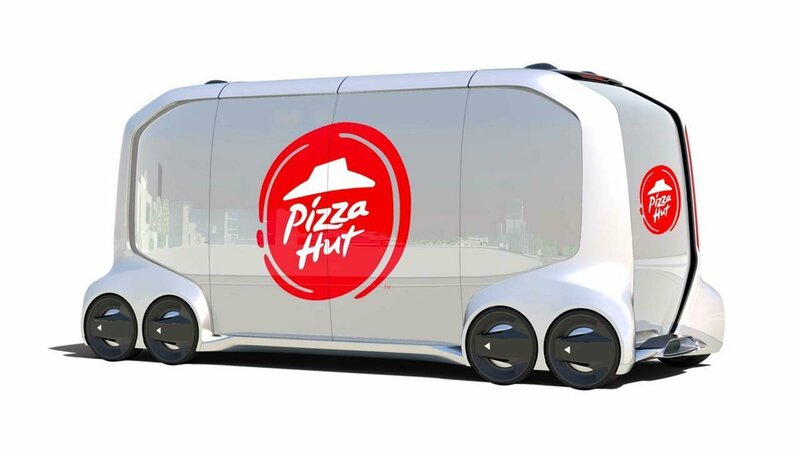 Pizza Hut's delivery truck would be electric and fully self-driving. Your Pizza Hut delivery could one day arrive via a self-driving Toyota van. "Today, you have to travel to the stores," Toyota president Akio Toyoda said at the event. "In the future with e-Pallete, the store will come to you." Although e-Palette is only a concept vehicle for now, he added that the company plans to pilot the technology at the 2020 Olympic Games in Tokyo. Tests in the U.S. and other areas are envisioned for the early 2020s. The vehicle will be electric and fully self-driving. It'll come with a low floor and open interior space, giving it flexibility to serve different purposes. The vehicle can be completely reconfigured in under 24 hours, according to Toyota. The length of the e-Palette will range from 13 to 23 feet, making it big enough to hold small stores. It's expected to come in three sizes. Toyota has committed to investment $1 billion in the self-driving technology needed to power the e-Palette. A 2017 Intel study estimated that the autonomous vehicle industry will be worth $7 trillion by 2050. Although the concept of a driverless Pizza Hut truck may seem farfetched, automaker Ford recently announced a similar initiative with Domino's Pizza with a specially-equipped Ford Fusion. The companies preliminary testing for the process at Mcity, a simulated city environment on the campus of the University of Michigan. Pizza delivery companies aren't alone in embracing innovative delivery methods. Amazon is testing drone delivery, and made its first delivery to a customer in December 2016.